Im after the advise of all you lovely ladies....whats kind of bouquet would go with my dress...i like the overarm ones but not sure if this'll go?? Hi, your dress is lovely. Because the detail is all at the top i would recommend a shower/trailing bouquet and not a handtie/posy. When you naturally carry a handtie it will cover some of the lovely detailing (you probably found this with the flowers your holding in the pic). If you like the overarm style(or tied sheaf style) then go with it. Something really classy like white calla lilies and glossy green foliage would look really good. I would go for something modern and classy with clean and simple lines. Also some diamonte would look great to pick up on the details of your dress. It's all just my opinion (i'm a florist) but hope it helps. Hi Shezza just wanted to say how fab you look in your dress!!! Im going for calla lillies too and i have seen some tall bouquets which are hand held as opposed to trailing if you prefer. I will try and find a link and put in on here for you. Fingers crossed the link works!! Shez, I couldn't believe it when I just looked at your photo - your dress is really similar to mine. the only difference is that the jewels on mine are in a slightly different style. Who is yours made by? Mine is Eternity Bridal. I don't have a picture though - can't believe I never thought to take one!! I'll get one at the next fitting. I'm getting married in Gretna Green so its only a low key wedding, but I still need to decide on flowers too. I'm thinking maybe lilies and roses. You look amazing in your dress by the way! 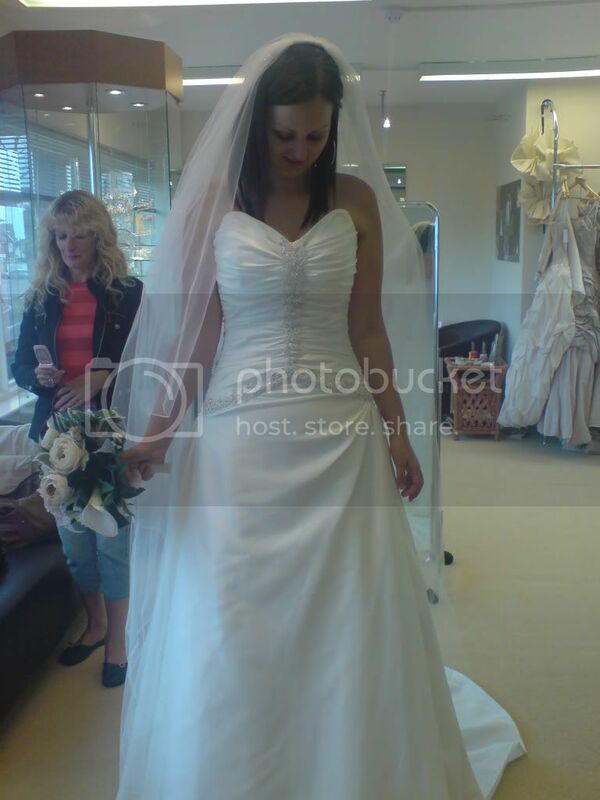 Ah thank you all...my dress is a limited edition maggie sottero..shop said its called 'Racheal'.